Humans and other animals cannot be infected with FIV. It is a “cats-only” infection. The Feline Immunodeficiency Virus is a slow virus that affects a cat's immune system over a period of years. FIV is not easily passed between cats. It cannot be spread casually - like in litter boxes, water and food bowls, or when snuggling and playing. It is rarely spread from a mother to her kittens. FIV stand for feline immunodeficiency virus. It is a lentivirus, the same class of virus as HIV. FIV, which can live in many different tissues in cats, typically causes a weakening of the cat's immune system. One of the tissues in which FIV lives is the salivary glands, so the most common route of infection is a deep bite wound from a FIV-positive cat to another cat. It can also be transmitted via blood, in utero and from milk from an infected mother cat. It is very rare for cats to get FIV from just being around infected cats, from sharing food bowls, or from a person touching a FIV-positive cat and then touching a FIV-negative cat. There are no specific signs of FIV infection. 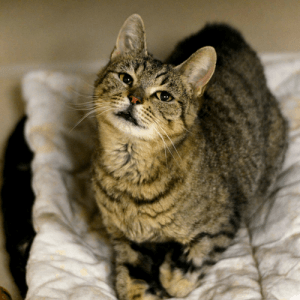 FIV-positive cats have a weaker immune system so they are more prone to getting infections such as upper respiratory infections, ringworm and dental disease. Other than that, FIV-positive cats tend to live normal lives and have a normal length of life. There are no proven treatments to rid a cat of FIV. Most FIV-positive cats handle the disease well, but it is important to concentrate on treating the secondary illnesses. What can be done to prevent the spread of FIV? There is a vaccine for FIV, but Best Friends does not recommend it because the vaccine does not have the best efficacy and, after a cat is vaccinated for FIV, the cat will test positive for the virus. At this point, no test can differentiate whether a cat tests positive for FIV from the vaccine or from having the infection. If a cat escapes and is picked up by local animal control, and then tested, the cat may be killed because he or she tests positive. Can FIV-negative and FIV-positive cats live together? Yes, as long as the cats get along and do not fight. The risk that a FIV-positive cat could spread the virus to a FIV-negative cat can be minimized by having them live in separate rooms until you are confident that they will not fight with each other. FIV-positive cats can live normal lives both in quality and duration. They do take special care in terms of monitoring them for signs of infection and they do have a tendency to have bad dental disease.